According to Discogs, Celer (Will Long) has 76 releases, and Machinefabriek (Rutger Zuydervelt) 99. You can add one to both, ’cause Will and Rutger joined forces to create the 7-inch ‘Maastunnel/Mt. Mitake’. Originally meeting and performing in Tokyo together in November 2010, the two began a collaboration in October 2011 by sending audio files back and forth. By the end of November, two tracks were completed, constructed from hours of material, ‘materializing’ the Tokyo-Rotterdam connection. The artwork was found by Will Long in a nostalgia shop in Jimbocho, Tokyo, the area famous for its many used bookshops, and the sleeve was designed by Rutger Zuydervelt. ‘Mt. Mitake’ is a mountain to the west of Tokyo, which Will Long climbed on the day between finding the artwork, and finishing the track. The other piece is called ‘Maastunnel’, named after the tunnel that connects the banks of the Nieuwe Maas in Rotterdam. You’ll hear recordings of the tunnel’s old wooden escalators, creating a fascinating symphony of squeaks and howls. ‘Maastunnel/Mt. Mitake’ was created to celebrate the upcoming Celer / Machinefabriek tour of The Netherlands and Belgium in March of 2012. Rutger Zuydervelt (Machinefabriek) meets Will Long in a charming trans-continental hook-up created to celebrate their upcoming tour of The Netherlands and Belgium. Originally meeting and performing in Tokyo in 2010, they began exchanging files and ideas in October 2011, and had completed hours of material by November, from which these two tracks were sourced. A-side ‘Maastunnel’, named after the tunnel which connects the banks of the Nieuwe Maas, uses field recordings of the tunnel’s old wooden escalators to lend a creaking, ethereal sense of space and place to their warmly symphonic ambient flourishes. Meanwhile the B-side ‘Mt. Mitake’, named after the mountain to the west of Tokyo, is a more placid, spacious piece, reflecting the sunny, blue-skied spirit of the images on the attached postcard, but with a brooding underlying element that should ensure you return to this side again and again. Maastunnel/Mt. Mitake are readily identifiable places. Maastunnel is a tunnel in Rotterdam and this track has some mystery. The piece opens on the outside approach to the tunnel (with the ambient sounds of water). There is an apparent twist in the plot where voices can be heard, “I didn’t see his face…he might have been just anybody…just anybody.” Suddenly, a break to the interior where vehicles are passing over expansion joints creating pulses that resonate throughout the underground structure before a quick return to the roadway above-ground. Mt. Mitake is a contrast to the underworld. It starts with a sense of floating in the clouds. The second section creates a sense of tension with the calming effects of the first section in the background; kind of a panoramic view with scenes changing. The peaceful opening section returns to close the track. When is a single not just a single? When it’s an event – in this case, the product of two stellar talents, joining forces for the first time. A shared concert in 2010 inspired these prolific performers to begin exchanging files between Tokyo and Rotterdam, resulting in seven vinyl inches of immersive beauty. The recording highlights the specific talents of each, while serving as its own unique creation. On “Maastunnel”, one can hear echoes of Machinefabriek‘s field recording work on The Breathing Bridge: gently withdrawing waves and feathery spindles of traffic, paired with Celer‘s willowed clouds of ambience and embedded static. The dropout at 2:37 raises the emotional ante with the repetition of the spoken words, “just anybody.” The bridge sways in the wind; the sonics rise; a lone vehicle speeds off somewhere in the distance. While it’s irresistible to speculate who did what, it’s enjoyable to remark at how well these two artists have been able to meld their visions. The beginning of “Mt. Mitake” sounds more like Celer, casting an undulating glow; but by the three and a half minute mark, the timbre seems more reminiscent of Machinefabriek: a building buzz that threatens to overwhelm, but never does. In the final minute, a three-note chime, offset by a twin contribution, wraps around to the beginning and lends the project a sense of completion. While listening, it’s easy to imagine one artist contributing the higher-pitched chime and the other the lower. In light of such an impression, the full dialogue sample found on “Maastunnel” seems particularly relevant: ”What did this man look like?” ”I didn’t see his face. He didn’t look up … he might have been just anybody.” By virtue of their extensive output and expansive careers, either artist could have imposed his sonic stamp on this project, eclipsing the other. Yet each keeps his head down and enhances the mystery. A full-length project would be divine, and thanks to an upcoming tour, this wish may soon come true. 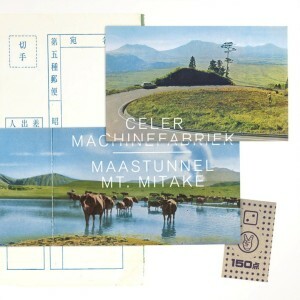 It was just a matter of time before there would be a collaboration between Celer and Machinefabriek, both being among the most productive musicians of this time. Not that Will Long (Celer) and Rutger Zuydervelt (Machinefabriek) actually got together to record Maastunnel / Mt. Mitake, but swapping recordings through the internet with each other is good enough in this case (and eventually they did a tour together in The Netherlands and Belgium so it all worked out well). For this two tracks both made recordings in the cities they are now living, Long in Tokyo and Zuydervelt in Rotterdam. These recordings got swapped to let both of the work with each others recordings. In the track Maastunnel we find recordings from Rotterdam (at least I would think so considering the name) which were reworked in such away that we still hear the creaking of the wooden construction in the building, but at the same time there is this very clear trademark of the music by Celer. There are long stretched sounds of which the source isn’t really recognizable any more. It has this feeling of sadness over it that we know so very well by now. But don’t let this hold you back at it is one with beauty. Great ambient music. On the flipside we find Mt. Mitake which seems to have a wee bit more the Machinefabriek stamp on it. Again we hear stretched sounds, but the sound is a bit sharper with higher pitched sounds. The field-recordings used here are more natural, with sounds from the rain (so it seems), as well as sounds from passing cars. As a whole the piece is a bit more on the heavy side with more bass and the ringing higher tones. Rutger Zuydervelt, ofwel de genius achter het productieve en immer kwalitatieve en evoluerende Machinefabriek project grapt er al over dat volgens de discogs website het ambientproject Celer 64 en Machinefabriek maar liefst 99 releases heeft uitgebracht. Tel ze bij elkaar op en je hebt een ontzaglijke discografie voorhanden. En nog mooi ook! Nu ze de handen ineenslaan is die gedachte niet zo gek natuurlijk. Dat ze samenwerken is dan weer te gek. Ik heb bij elkaar niet meer dan één derde in kast staan, maar beide artiesten zijn aan elkaar gewaagd zowel qua muziek als artwork. De samenwerking is het gevolg van een optreden en ontmoeting in Tokio in 2010. Samen brengen ze nu de 7” Maastunnel / Mt. Mitake, wat op papier een groot contrast lijkt, namelijk de drukke betonnen verkeerstunnel tegenover de serene omgeving van de Japanse berg. Toch haken de twee nummers met diezelfde titels vooral aan bij dat laatste. Ze brengen twee rustieke, elektro-akoestische klanklandschappen die het mooiste van beide naar boven haalt. Serene ambient gaat hand in hand met subtiele drones en fijnbesnaarde samples van omgevingsgeluiden en stemmen. Het is zinnenprikkelend en tot de verbeelding sprekend. De schoonheid van beide tracks, die samen net onder de 10 minuten finishen, is gewoonweg verbluffend. Kopers van de single krijgen er overigens ook nog twee fraaie video’s bij van Marco Douma. Een kleinood om innig te koesteren en een samenwerking die wat mij betreft snel een full-length vervolg mag krijgen.